Tyler York plays a Haida man who’s inner monster overtakes him in Edge Of The Knife. One of my goals each VIFF is to see a Canadian feature-length film. I had the good fortune when I went to see Edge Of The Knife. Not only is it a Canadian feature, but possibly the only feature-length film ever completely in the Haida language! The film begins with the carving of a wooden mask and then burning it in a fire. The story begins with a meeting of two Haida families over at the Haida Gwaii in Northwestern BC in the 19th Century. It’s an annual fishing camp the families have together. Adiits’ii is the oldest son of and close to the family of Kwa and his son Gaas, who sees Adiits’ii as his mentor. Kwa’s wife Hlaaya finds his appetite for challenges to be too reckless for her son. However Adiits’ii often feels belittled by his own family. Sometimes Kwa makes him feel inferior. In the evening, Adiits’ii decides to take Gaas onto the waters on boat. Overnight a storm hits the coast. The families fear the worst for Adiits’ii and Gaas. The next morning, the bad news. Gaas is found dead on the coast. Adiits’ii is missing and presumed dead. However Adiits’ii is still alive. He’s in a remote forested location and feels he can’t return because of the reactions from others he fears. Secluded, he becomes overtaken by a huge spirit. He transforms into a Gaagiid/Gaagiixiid — the legendary Haida Wildman — and his behaviors become feral and even demonic. The whole family searches for Adiits’ii. Kwa and his wife are first to discover Adiits’ii, but lashes out at him wanting to kill him. The wife tries to stop him, but that leads Kwa to speak out his belief of who he thinks Gaas’ true father is. The families work to get Adiits’ii captured before they can free him from his possession. They set up a trap and they succeed. It’s at a ritualistic ceremony that involves prayer and piercing of the chest that they have to free Adiits’ii from the possession of the Gaagiixiid. The film ends with Adiits’ii carving out a mask out of wood, the very mask seen at the beginning, and burning it. At the end, we notice it’s in the image of how Adiits’ii was when possessed by the Gaagiixiid. As far as film quality goes, this is a film I’d call great, but not excellent. The story is very good as it focuses on physical actions and unspoken feelings. However I have seen Canadian films with better dialogue and better story lines. Culturally, this is an excellent film as it captures the Haida culture and the Haida language without any interruption of the English language. Also it captures Haida mythology with excellence. It introduces us to the Gaagiixid. I am not familiar with Haida culture at all, but the film gives me a good understanding about the mythological belief of other beings. We should remember that Adiits’ii is a person with personal demons. He feels like the misfit and he feels like he’s belittled. Although he doesn’t say it, it’s obvious. After the accidental death of Gaas, it’s his guilt that gets the best of him and runs away. It’s there when he turns into the Gaagiixid. I believe the Gaagiixid is all about his personal demons and bad self-image. He had to conquer the Gaagiixid inside of him to truly come to peace with who he is and what he did. Also the film has been widely welcomed and celebrated by the Haida peoples and other First Nations peoples of BC. I remember a couple of times during the VIFF, I was waiting to see a film after Edge Of The Knife over at the theatre I was to attend. Each time I was in line, I was given the news that there would be a 30-40 minute delay of the start of my film. As Edge Of The Knife finished, I saw more than just people exiting. I saw some dressed in traditional First Nations costume. Some even brought drums and performed a song of celebration. When I saw that, I felt I had to see Edge Of The Knife when I had the chance. This was more than just something. I’m glad I did. Gwaii Edenshaw and Helen Haig-Brown did an excellent job in directing and creating a world far back in the past and appear authentic. The script by Gwaai and Jaalen Edenshaw, Graham Richard and Sandercock was not too intense in terms of dialogue, but it does present a very good story that’s more about emotions and image-based. Tyler York did a very good job as Adiits’ii. His acting was more about what was inside of him rather than what he said. Willy Russ almost stole the show as Kwa. The actors involved are more of a Haida community rather than actors by profession. All did a very good job. The film was light on special effects, but the effects fit the film and the scenes right. It didn’t need more effects than necessary. Edge Of The Knife may not be the best Canadian film I’ve seen or even the best of subject of First Nations peoples. However this is a very culturally-important film that deserves to be shown. It also tells its story in both an entertaining and mesmerizing way. Definitely worth seeing. Merly Streep plays newspaper head Katharine Graham in The Post. The subject matter of The Post doesn’t sound like the type of subject matter that would win a big crowd, but it is a film worth seeing. The story goes back in 1966 during the Vietnam War. Military analyst Daniel Ellsberg is in Vietnam with General Robert McNamara to document the progress of the war. McNamara admits to Ellsberg and President Johnson that the war is hopeless but has confidence in the effort, leaving Ellsberg disillusioned. Years later, Ellsberg is now working for a military contractor and comes across classified documents showing the US’s decades-long involvement in the conflict in Vietnam going back to just a few years after World War II ended. Ellsberg discloses the documents to the New York Times. It’s 1971. Katharine Graham is head of the Washington Post. It’s been a position she mastered with a lot of difficulty as it’s commonly seen as a ‘man’s position.’ Even though her family founded the Post, the position of the head went to her husband Philip instead of her. It was right after Philip’s suicide that Katharine became head. It’s not easy for a female to be head of a newspaper. Especially someone like Graham who has a good work ethic, but lacks experience and is constantly overruled by the aggressiveness of the men of the Post. On top of that, she seeks to gain an IPO for a stock market launch to propel the Post to greater strength. The Washington Post however is second-fiddle to the New York Times which always has the biggest news scoops, even the scoops of what’s happening in Washington. Editor-in-chief Ben Bradlee is one of the men who work for her. He tries in vain to be one step ahead of the New York Times in coming up with the latest scoops, but falls short each time. Meanwhile McNamara, who is a friend of Graham’s, confesses to her of how he’s the subject of bad news in the New York Times. It’s through their constant expose of the government’s deception of the American public. However a court injunction blockades any further publication of such news by the Times. Ellsberg is willing to provide the documents and opportunity to the Post to publish the stories. As they look through the stories to publish, lawyers to the Post advise against publishing the story, fearing the Nixon administration will press criminal charges. Graham seeks advice from McNamara, Bradlee and Post chairman Fritz Beebe of whether to publish. It’s made even more frustrating when the lawyer note that since the sources are the same as the New York Times, Graham herself could be charged with contempt of court. It’s a gamble. Graham risks terminating the newspaper her family established. Alternatively, the Post won such a legal battle, it would establish itself as a major journalism source, much on the same level as the New York Times. She agrees to have the story published. The White House retaliated by taking both the Times and the Post to the Supreme Court to argue their case of publishing classified document information being a First Amendment Right. Both newspapers receive almost unanimous support from the other newspapers in the US and they win their Supreme Court battle 6-3. An infuriated Nixon bans the Post from the White House. And the rest is infamy… for Nixon. The film is more than just about a top secret story that needed to be exposed and makes journalism history. The story is also about the newspaper behind the story. We shouldn’t forget that this came at a time when The New York Times was the newspaper that delivered the biggest news about what was happening in the Oval Office and the ones to do it first. Even though the Washington Post was the newspaper of Washington, DC, it was more of a second-fiddle newspaper like the newspapers of the rest of the cities. The New York Times lead and all other newspapers, including the Washington Post followed. This story allowed the Washington Post take pole position towards what was happening in Washington. This would also allow for the Washington Post to be the prime newspaper to go to upon the breaking of the Watergate Scandal. Even despite the Post competing against the Times, they united when they faced the heat of the freedom-of-speech debate and won together. The film is not simply about a history-making story, a legal breakthrough or even a milestone for a newspaper. It’s also the personal story of Katharine Graham and how she had to achieve greatness for herself. Katharine Graham was born into the paper and assumed control of it right after her husband died. It was always tradition that a man headed the newspaper. After the suicide of her husband, she headed it. The paper her ancestors founded and the paper she wants to propel into marketability. This news story could help be the boost she needed, but the court injunction against the New York Times causes her to put it on hold. Basically she’s gambling everything with this touchy story: the Times, her status as a leader, her role as a woman with power, her role as a mother, even her own personal freedom. In the end, that one decision caused left all of us convinced she did the right thing. She did more than just allow a story. She did more than boost the profile of the Washington Post. She created a breakthrough in freedom of speech and freedom of press. On top of that, she earned the respect from her male colleagues. That was rare back in the early 70’s. This story is very relevant to the present. We always hear those words ‘fake news.’ We have a feeling that Donald Trump is like a big brother monster who wants to control everything. There are often times in which I wonder if the times of Nixon were worse than the times of Trump. I know all about Nixon and his lust for control. Whatever the times, the story and the court ruling against government censorship of the press serves as a reminder to all citizens that the press has the right to publish the truth to the public. The ruling of the New York Times vs. The United States of America back then was clear: “‘In the First Amendment the Founding Fathers gave the free press the protection it must have to fulfill its essential role in our democracy. The press was to serve the governed, not the governors.” That ruling still applies today. Leave it to Steven Spielberg to direct a story that will capture our intrigue. Some would describe this type of story as a ‘boring story.’ Steven Spielberg knows how to direct it into something interesting and have us glued to the screens. The screenplay by Josh Singer and Liz Hannah also creates the right interest and intrigue. They’re able to take the chain of events surrounding the publishing of the story and turn it into a story of intrigue. Even a story from a humanist side. Once again, Meryl Streep delivers in creating depth in a public figure. She gave Katharine Graham the right dimension and the right humanistic tone to make the story work. Tom Hanks also does an excellent job in his role as Ben Bradlee. He delivers in the character very well as he adds some dimension to Bradlee too. The supporting actors may have minor or limited roles, but they add to the film too. Janusz Kaminski does an excellent job of cinematography and John Williams again delivers a fitting score. The Post is a journalism story that will keep one intrigued. It’s a story that’s very relevant today as it’s also about our own right to know the truth. Benedict Cumberbatch plays mathematician/inventor Alan Turing through many angles in The Imitation Game. The Imitation Game is a film that presents us a story of legendary scientist Alan Turing. It shows who he is and his life but also sheds light on many things we didn’t know. The film opens in 1951 with Alan being investigated by detectives Nock and Staehl. This takes the film back to moments of the past starting in 1939. World War II has started and Turing applies to become part of the cryptography team at Bletchley Park. His ability to decode things and his knowledge that the Nazis use a code called Enigma impressed Commander Alasdair Dennison so much, he brings him on with the team of Hugh Alexander, John Cairncross, Peter Hilton, Keith Furman and Charles Richards. Turing is difficult to work with as he distances himself from his colleagues. He has an idea for a machine to decipher Enigma but Commander Dennison doesn’t approve. Turing writes to Winston Churchill asking for assistance. Churchill is so impressed with Turing’s idea, he declares him the leader upon which he fires Furman and Richards. He uses a crossword puzzle to find his replacement. Upon which he hires a woman, Cambridge graduate Joan Clarke. Joan however has to deal with her overbearing parents as they don’t want her to work with men and marry immediately. However Turing is convinced enough she’s the right person for the job to the point he provides her a room to stay and work with female clerks while he shares his plans with her. Difficulties continue as the code of Enigma needs to be reached. First the Germans change the code daily so that the enemies don’t succeed in breaking it. Secondly, Dennison is infuriated with the machine which Turing names Christopher and wants it destroyed and Turing fired. It’s only after the team threaten to leave if Turing is fired that he’s able to continue. Joan is pressured by her parents to either marry or leave her job, to which Turing proposes to her. On top of it, Turing’s team know of his homosexuality but promise to keep it secret. Even after results happen and Christopher is able to successfully decipher Enigma, the solutions don’t start there. They can’t make it obvious to the Germans that they know Enigma so they have to carefully plan their strategies of attack even if it means considerable time later. Turing learns Cairncross is a spy for the Soviets but is told to keep it a secret or else Cairncross will expose his homosexuality. The place becomes too dangerous for Joan to stay and Turing tells her to leave, outing himself to her and even saying he was only interested in her as a co-worker. Joan leaves angrily. World War II was won and the cryptographers plans are burned. Some would first come to the movie thinking it’s about him and his lifestyle. Some would first think this is autobiographical. It’s more. It presents the story of Alan and his eccentrically intelligent and creative thinking. It presents Alan’s side of the story from beginning to end focusing on the three biggest events in his life: in 1928 as a teenager when he’s first given support of his eccentric imaginative thinking and first learns of his homosexuality; during World War II and the story of the moment and invention that defined him; and in 1951 with Scotland Yard’s trying to link him of a crime only to discover his secret that would lead to his tragic fate. The focus of the story is especially clear at the beginning when Alan asks us: “Are you paying attention?” The film also presents why it was so important for this machine to crack Enigma had to be created as Alan would remind us it wasn’t simply against the War but against time. Especially for the UK which was suffering terribly. It also presents their strategy for helping to win the war as soon as they could. It’s also very much about Alan the person as it is about Alan and the team working to crack the code. It presents Alan’s intelligence as creative in which he can decipher things through his work on crossword puzzles. It presents Alan as one who also has a very unlikable side including a ruthlessness his coworkers found hard to deal with though they stick with him because they feel he’s the only one who can succeed at cracking the code. They can’t stand him but they believe in him. It especially presents Alan’s homosexuality as for why he was about to go on trial. As he is about to be tried, he looks back on his life for when he was part of the mission to his schoolboy days and his encouragement from Christopher: the one person who truly understood him. It ends with Joan, the one colleague who knew him best and deserves to desert him after what he said to her but comes in the end to remind him of his significance to this world. The movie tries to show more of what Alan Turing did as an effort to combat the war rather than focus on his lifestyle. Actually the movie does show about the struggle with his homosexuality throughout his life. His first difficulty came in high school as he fell in love with his friend Christopher and had to pass notes in his special code to him. We should remember that Alan was not beaten up in high school because he was gay but because of his intellectual eccentricities where it first showed its presence. He had continued difficulty during his work as even though his colleagues were supportive of him, they did remind him he could lose his job and be imprisoned because of it. Joan appeared to be the one who dealt with it best as she was not afraid to be in a sham marriage with him especially since it would help get her parents off her case. Then we see at the end as Alan has to deal with his ‘chemical castration’ which would eventually lead to his suicide at 41. We should remember those were the times. It’s because of the criminalization of homosexuality in the past that we had the pride movements that spawned out of the 70’s and are what they are today. 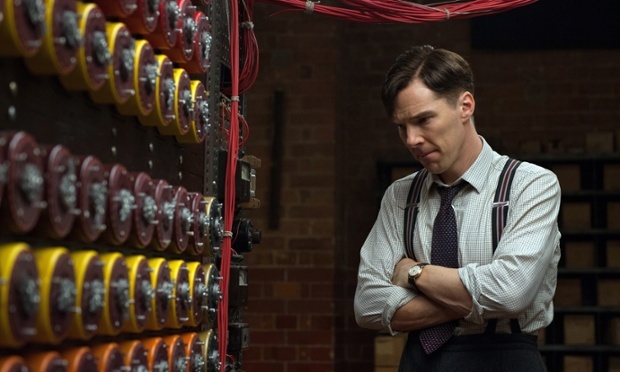 Benedict Cumberbatch did an excellent job in his portrayal of Turing. His performance was full of dimension for a person who was hard to like and had quite an imagination but quite smart and even troubled in the end. It’s a role where he not only acts off of his actors but us the audience too filling us in on all the details and making us think too. You can tell when Alan as narrator tells us to pay attention. Of the supporting players, it’s Keira Knightly as Joan who shines the best as the one who not only helps decipher Enigma but is the one person who can decipher Alan as a person in the end. The actors making up the cryptography team–Matthew Beard, Matthew Goode and Allen Leech– did great both as a team unit and in their own individual moments. Other standout supporting performances came from Rory Kinnear as detective Nick and young Alex Lawther who did a remarkable job playing the young Alan Turing. Also deserving of acclaim is director Morten Tyldum. Very experienced in his home-country of Norway, this is actually his first direction of a English language feature and it’s an excellent first-effort. Also excellent is the script from Graham Moore. He did an excellent job in creating the story off of Andrew Hodges’ biography setting the three periods of Alan’s life that defined him most and piecing it all together. It succeeds in keeping us interested. Technical aspects were also excellent such as the set design, costuming, cinematography and the composed score by Alexandre Desplat. The Imitation Game is a unique story about a scientist who went from a hero to a criminal of his time. It tells the story through his eyes and leaves us both interested and getting us to think as well. That’s the movie’s best quality.